The funeral of my dad, Dr. Rev. Lloyd E. Marcus, was July 7, 2018. My sister told everyone she was wearing a yellow dress to Dad’s funeral because we wanted it to be a celebration of Dad’s extraordinary life and homecoming. Yellow represents bright sunshine. She also chose it to represent God’s “Son.” My sister’s idea caught on like wildfire. 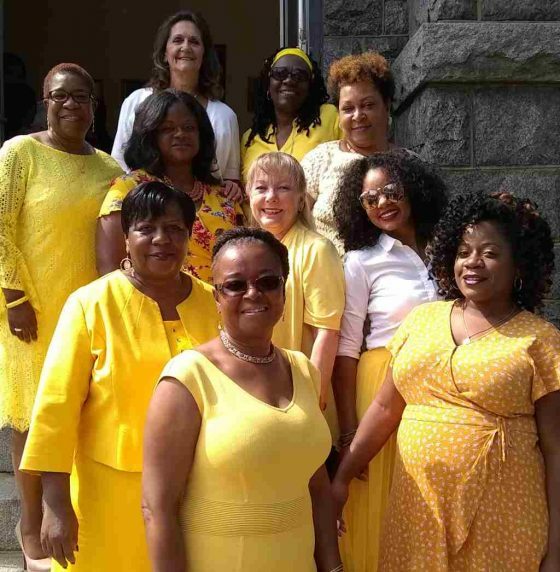 Surprisingly, several women showed up at Dad’s funeral wearing yellow. I was only able to gather a handful of the lovely ladies for a photo. God’s grace and timing for Dad’s passing was perfect. Although he was 90, had Dad passed two months earlier, my three brothers, sister and I would have been devastated. Dad was placed into home hospice. Dad outlived two wives. His second wife died in March. As Dad’s health rapidly declined, each of his five kids took shifts taking care of him. The hospice nurse said typically only one child shows up to care for their dying parent. Whenever my sister spoon fed Dad and whenever us four sons bathed him, Dad told us he was ready, happily anticipating going home to Jesus. This helped us release Dad. The day before Dad died, all five of us gathered around his bed. Dad appeared unconscious with his eyes closed. Earlier, the hospice nurse told my sister that hearing is the last to go and Dad would be able to hear us. Each of us spoke so dad could hear our voices. We told Dad that he did a great job raising us, we loved him and we would be okay. Dad appeared to give a sigh of relief. From that moment, and I sensed my siblings felt the same, I was at peace with Dad going home. God had graciously prepared us. The warm united vibe in Dad’s bedroom was amazing. My brother David is not big on making touchy-feely statements. He blurted out, “Thank y’all for being who you are.” I knew what David meant. We were united in love for our father and each other; committed to sending Dad peacefully home. When Dad’s health began declining, I knew if we, his 5 kids, did not handle the process correctly, it would haunt us for the rest of our lives. Each of us stepped up and did our part. Dad’s funeral was a wonderful celebration. Citations were read from Baltimore’s mayor and the Baltimore Fire Department. Pastors and community leaders spoke of how Dad impacted theirs lives, congregations and communities. Dad was a man of several firsts – Baltimore’s first black paramedic and first black chaplain. The fire department chaplain who spoke at the funeral said Dad was also the first firefighter to become a chaplain, which paved the way for other firefighters to become chaplains. When I spoke at the funeral, I shared how Dad strove to be excellent and walk in biblical principles despite horrific racist working conditions at Engine 6. Dad could not pour himself a cup of coffee from the same coffeepot as the white firefighters. I said no special concessions (lowered standards) were made because Dad was black. And yet, Dad won “Firefighter of the Year” two times. The audience erupted with applause. At the reception with food called “the Repass,” one of Dad’s grandsons told me he had no idea of the humiliating racism his grandfather endured as a civil rights trailblazer. He wasn’t sure he could have taken it. The twenty-something year-old said the information gave him as insight into where he came from and who he is as a Marcus. Black firefighters at the funeral said Dad corralled, encouraged and mentored them to take the test to become firefighters. A private conversation I had with a gentlemen at the funeral epitomized Dad. The gentlemen said several years ago, he was going through a severe crisis. He knocked on my parent’s front door at 3 am. Rev Marcus opened the door, invited him in, listened and ministered to him. That’s my Dad. Years ago, a book was popular titled, “Passages.” I never read it, but I feel like I have entered a new passage of my life. With Dad gone, I am the patriarch of our family. Like my 4 siblings, I want to continue making Dad proud. While in Baltimore for Dad’s funeral, my wife Mary and I stayed at his home. I noticed Dad’s slippers on the floor and put them on my feet. I told Mary, “Wow, I have literally stepped into Dad’s shoes.” God has prepared me for such a time as this.